The path through the Serrai di Sottoguda Gorge was one of the trails included in the Accessible Dolomites project: a scheme promoted by the UNESCO Dolomites Foundation. Oscar De Pellegrin, the Paralympic archery champion, has no doubts about its value: “We’ve had calls from Australia and America asking for information about the Accessible Dolomites project, and we believe it could prove an attractive scheme in terms of tourism, and a model we can export all over the world”. Here is yet another reason to start rebuilding the Serrai. Precisely in relation to accessibility, the UNESCO Dolomites Foundation and the Municipality of Rocca Pietore intend to restore the Serrai Gorge to what it was before: a place where hikers, families, the disabled and the elderly can be surrounded by the history of the earth, able to enjoy the great rock cliffs without the need to tackle difficult paths. Last July, in Rocca Pietore, the president of the UNESCO Dolomites Foundation, Graziano Pizzimenti, presented the Special Pelmo d’Oro Award to Oscar De Pellegrin. 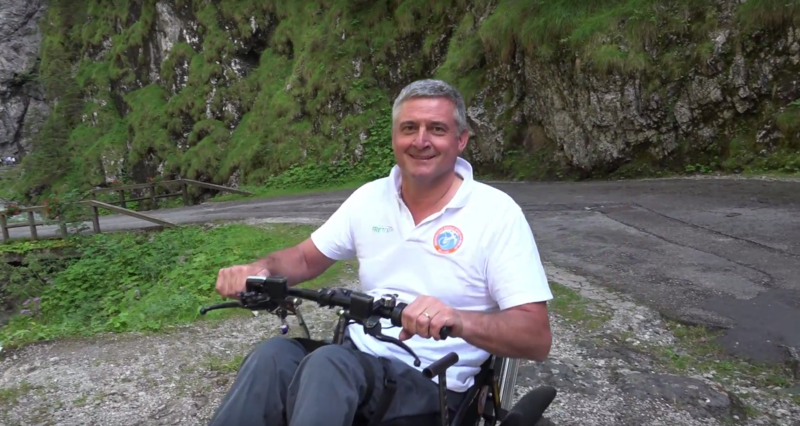 “I try to do my best, thinking of those people who want to experience these places despite their disabilities,” De Pellegrin explained as he travelled through the Serrai Gorge. “Listening to the sound of the stream and breathing this pure air gives one a new lease of life.” The project for the Serrai Gorge of the future will not only make it accessible but will also have very low impact. We must ensure we design it in such a way that the 29th of October 2018 is not just a memory, and that visitors to the Gorge, from all parts of the world, are given sufficient information about its value in terms of geology and landscape. The Dolomites should not just be a heritage of us all, but also for us all. This is the task that the UNESCO Dolomites Foundation has undertaken with the Accessible Dolomites project, an initiative funded by the Ministry of Cultural Heritage and Activities under the terms of Law no.77/2006. The 23 trails can all be found on our website www.visitdolomites.com, where you can download a detailed description of the features of each route in Italian, German and English, a detailed map of the trail, the GPS tracks, and a list of the environmental and geomorphological features of the area. You can see a preview of the route at Google Street View. In recent years, the UNESCO Dolomites Foundation has also assumed responsibility for coordinating the Interreg I-A “GATE” project, which, with the help of various partners outside Italy, aims to make tourism in the Dolomites more inclusive. The aim is to allow a growing number of people to experience the mountains, by reaching beyond not only environmental and physical barriers, but also linguistic ones. The project is financed by the European Regional Development Fund Interreg V A Italia-Austria 2014-2020, and plays an important part in the implementation of the Overall Management Strategy, which focuses, among other objectives, on the question of accessibility in its broadest sense: as a need to overcome cultural and mental barriers, as well as physical ones.